Syncback is an excellent backup tool which we use here to control client backups. There’s a free version and a more powerful paid version. They both suffer the same problem as other backup tools which is the inability to schedule a backup for a user profile that has a blank password. Double click it the subkey “LimitBlankPasswordUse”. If it’s set to 1 it will not allow blank passwords so change this to 0 (zero). Exit the registry editor and you should now have the ability to schedule without passwords. 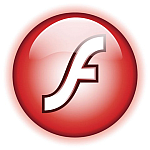 Removing Adobe Flash Player from Windows is required generally because it will not install correctly. In all cases here is the logical method I use to remove and reinstall corrupted installations. All OK so far? Let’s go a bit further then….. Perhaps print this off or bookmark the page in your favorites folder so you can return to it as we’ll be restarting the PC and closing the browser window. Backup the current registry settings. Close all open programs. 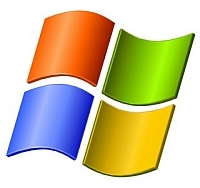 Create a Windows System Restore point. This will help us to get back to this point in time if anything untoward happens. 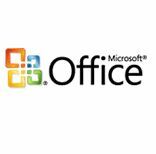 Close all programs INCLUDING ANY MESSENGER PROGRAMS LIKE WINDOWS LIVE MESSENGER. “File”, “Exit” or “Quit” usually does the trick for messenger programs. Drop into Control Panel and open Add/Remove Programs (Windows XP, 2003) or Programs and Features (Windows Vista and 7). Remove any entries for Adobe Flash Player and Adobe ActiveX. Make sure that Internet Explorer security is set to the Medium: Default level, which allows viewing ActiveX controls. Alternatively, and a better way to do it for this purpose, is to configure the Custom level to view ActiveX controls with the next steps. Select the Custom Level instead of the Default Level and do the following. Set “Download Signed ActiveX Controls” to “Prompt”. Set “Run ActiveX Controls And Plug-ins” to “Prompt”. Download the free CCleaner program from here. Install it and opt out of the free Google toolbar install by unticking the selection (it’s your choice but I don’t like the toolbar). Run it and click on “Run Cleaner”. This will remove all your temporary Internet files and Cookies along with your Internet history and lots of other clutter. Now select “Registry” from the left side, “Scan for Issues” and when finished, “Fix selected issues”. Save a backup if prompted. Now restart your spring-cleaned computer! Download and run this ‘Standalone Executable Installer’ for Flash Player (Internet Explorer only) Basically, if you run Internet Explorer you will need this. Download and run this Flash Player standalone plugin if you use another browser such as Firefox, Safari etc If you don’t run another type of browser and just use Internet Explorer then you don’t need this. If you are still struggling, then it may be a problem within Internet Explorer. Taking it back to ‘factory settings’ sometimes helps. If you don’t already have it, install Firefox and run the Flash Player Standalone Plugin, then restart Firefox. Visit youtube.com and if you can see the videos you have Flash installed (and I would definitely recommend using Firefox over IE any day)! Leave me a comment (or buy me a coffee) if this has solved your problem! 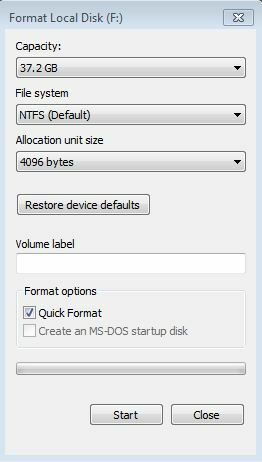 Sounds simple right, format an external hard drive using FAT32? Well yes if the drive is a smaller Pen Drive, but as we get towards the larger drives of 32GB or more, then Windows 7, Vista and XP all refuse to touch it unless it’s formatted NTFS. There are plenty of good reasons why we’d want FAT32 and one of them is probably why you’re reading this. Projects suitable for this method include sharing a large drive with a Mac, creating a compatible drive for some TVs to read and record to and making a multi-boot external diagnostics disk. The only other choice offered is exFAT which is not the same. I have noticed that other websites will offer different complex solutions and link to deprecated or paid tools, but by far and away the easiest and simplest way is to use a graphical tool called FAT32 format. You can download it here. It’s free , small and simple. Here you can see I’m running it on a 40GB external drive. Make sure you select the correct drive to format! If in doubt, go to My Computer or Windows Explorer to verify you have selected the correct one. If you are formatting the drive, it’s always best to deselect (uncheck) “Quick format”. It will take longer but the result will be better. 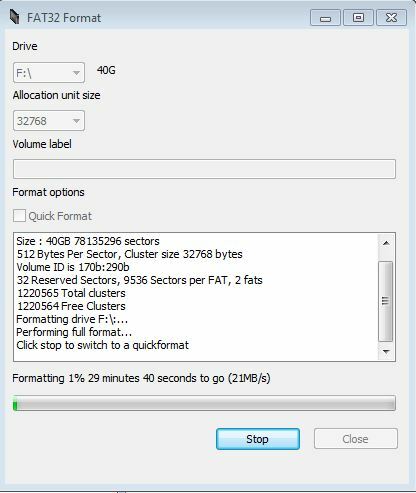 Just bear in mind that FAT32 does not support individual files above 4GB but this should not be a problem for most people unless trying to copy larger BluRay DVD images etc. Hope this works for you and your project, please let me know below!